"This trip, for me, felt like a time of inter-class bonding for the Glee Club. I developed friendships with many people I hadn’t spent much time with before. I think going on tour gives an opportunity for the choir to bond in a new way, because during other times of the year, many of us only see each other during rehearsals. On tour, though, the whole choir has the chance to eat, talk, be silly, and explore a new place all together, while also making music in some truly stunning spaces. I will never forget several elderly audience members coming up to me after we sang in León and telling me in English that they would ‘like’ the Glee Club on Facebook. This tour was truly an experience full of growth as musicians, friends, and people." 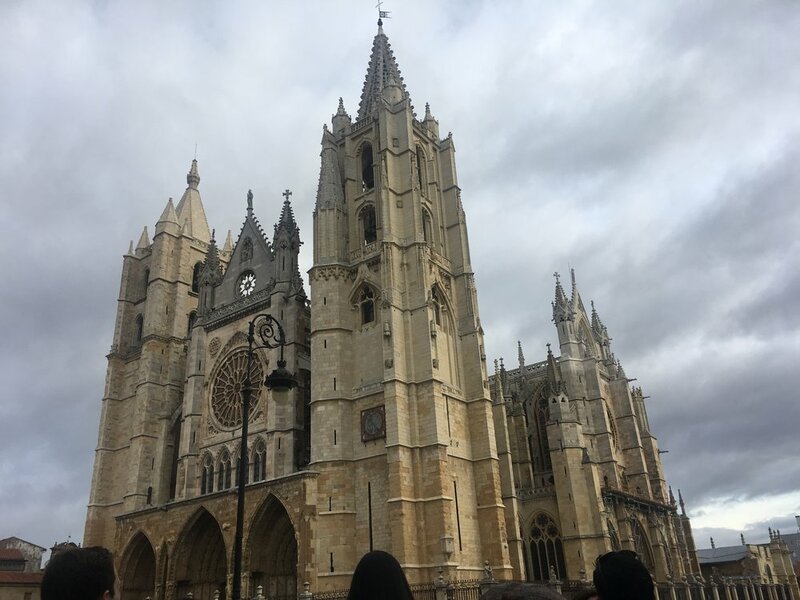 "My favorite part of the whole week was when the last refrain of “My Soul’s Been Anchored in the Lord” rang between the walls of the Iglesia de Santa Marina la Real in León. Even the very sky applauded with a wild winter flurry. Such a special performance in such a place made more memorable the ensuing night out with newly-formed friends in the Glee Club." "Not to be dramatic or anything, but tour was actually one of the best trips I’ve ever been on. There was just something special about coming together in such beautiful churches and hearing the music you’re making echo off the walls." "Tour was a great way for me to connect more with both the undergraduate and graduate communities. I truly feel as if I grew closer to everyone I conversed with and got to know people I wouldn’t normally have gotten the chance to talk to. Isn’t it amazing that we could all come together and bond over our mutual love of singing?" "There’s something really magical about getting a bunch of passionate students together in that sliver of time when they have no academic engagements hanging over their heads. Add the beauty of Spain and the togetherness of Glee to that and holy cow–there’s a trip that I’m sure none of us will let go of anytime soon. Singing–yes in the churches, but also in the streets and in the hotel rooms brought about a solidarity and strength that may or may not have almost got us all thrown in Spanish prison. Even if that had happened though, I could think of no better cell mates." "I close my eyes and hear our songs, our muffled laughter rising in the cathedral of Leon. What could have been the ecstasy of a pilgrim who walked the camino from eastern Europe in the Middle Ages, leaving everything behind, not knowing if he would make it back to his home country? Entering the majestic Leon cathedral after weeks of solitude, looking up at the glowing saints in stained glass, must have felt like heaven. Now, when I close my eyes, the rich voices of Glee singers mingle with the thousands whispers of anonymous pilgrims. It was a blessing to sing in these sacred places, with a group we got to know and love better every day." "The tour reminded me of what I love most about choir: the unity of voices and of people. Following the path that we had sung about so many times in Santiago and performing it in such ornate churches are experiences I’ll never forget." "This tour was hands-down one of my most musically and socially fulfilling experiences ever, both as a conductor and as a singer. I’m endlessly grateful every day to have this job, but on tour, it hit me over and over again how lucky I am. When up in front of the group, it was the moments of eye contact that meant the most to me… there’s something amazing about making music with an audience behind me while connecting with the same phenomenal people I was laughing hysterically with on the bus a few hours prior. It’s like, wow, today I was literally skipping through the streets of northern Spain with the wonderful people in front of me, but also right now we are making this unbelievably profound and beautiful and magical thing together. *wink*"
"It was simply the highlight of my time at Princeton. I’ll remember it, the people I traveled with, bonded with, and sang with forever." "A huge thank you to everyone who helped make this year’s tour so special. 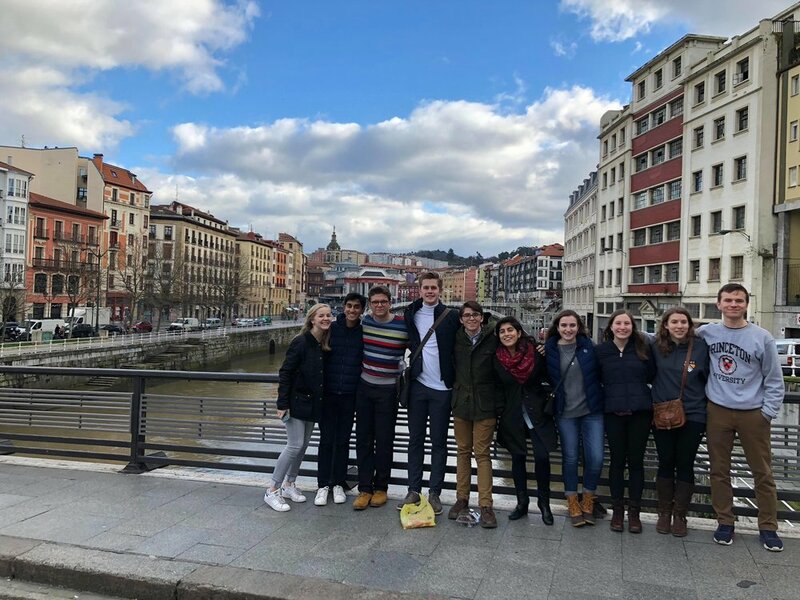 From performing in grand cathedrals bundled up in our winter coats to humming Talbot while walking along the Camino de Santiago, the Glee Club made countless incredible memories during our time in northern Spain. España, muchísimas gracias por su hospitalidad (y comida deliciosa!). Un abrazo muy fuerte,"
"I’m overwhelmed when I try to distill a single example to encapsulate the richness of my tour experience with the Glee Club. There were too many moments to name. I feel so privileged to have the opportunity to make music with 85 of the most wonderful humans I’ve had the pleasure to meet at Princeton. Graduate school can feel solitary at times, but the Glee Club has welcomed me into the Princeton community with open arms and helped me to find my home here. I am so grateful to those who gave so generously to support our trip to Spain. Singing in such beautiful sacred spaces with such wonderful and giving colleagues was a once-in-a-lifetime opportunity." In our rehearsals in both America and Iberia, as well as in the first three concerts of tour, these lines called to my mind the feeling of spiritual transformation and nearness of the great beyond that was likely present in the heart of a pilgrim who just finished their own camino. I imagine this feeling would wash over them as it washed over me in the Cathedral of Santiago de Compostela. The Botafumeiro, literally “smoke expeller” in Galician, is a massive incense burner that flies like a pendulum through the body of this house of worship. In its nine hundred-or-so-year-long history, this swinging pot of smoke has only broken loose of its rope twice, both times flying straight out of the church through a door, missing the crowds pilgrims and parishioners. During a mid-Saturday mass on the last day of our tour, I found myself shaking in fear as this holy silver wrecking ball careened toward me again and again, each time pulling upward and sparing me at the last minute. Thankfully, the calm gaze and warm smiles of some old and some budding Glee friends reassured me that my life was not, in fact, ending." "On this tour, I learned so much about the history of a country I knew hardly anything about. Each cathedral we toured was a new experience -- and incredibly exciting for this history major. The privilege of singing in cathedrals and other sacred spaces 500 years old or older was truly special. 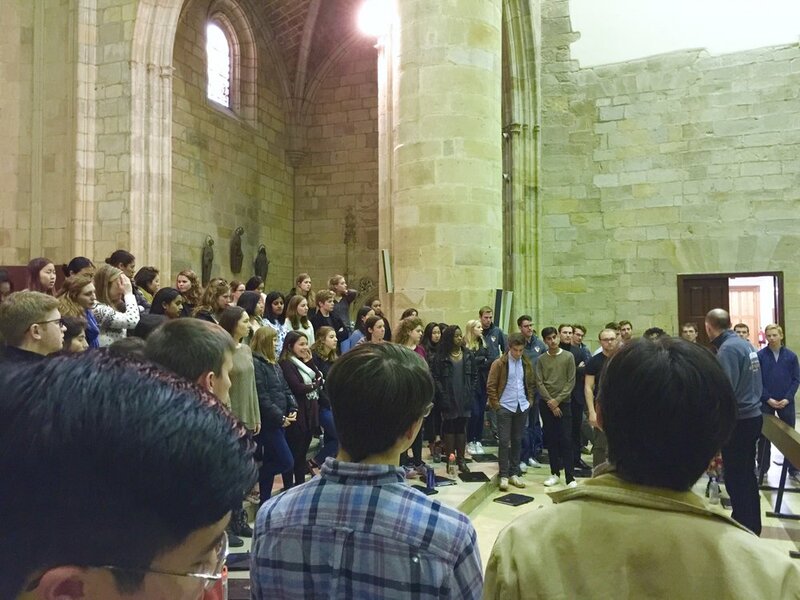 I will never forget the feeling of singing with some of my favorite Princetonians halfway around the world as we did our very own camino." "My favorite concert of this tour was the one in León. The venue provided amazing resonance (and much needed warmth). The audience fizzed with enthusiasm and zealous applause. For me, the moment of magic came when the church clock rang as all of us together, some 80 choristers strong, sang the Herr Santiago theme. The bell resounded in tune with our chord and blended with our sound. When the theme ended and we drifted into silence before beginning the next section of the piece, you could still hear the lingering lull of the bell, floating in this moment of suspension that enraptured both the audience and us performers alike." "One of my favorite concert memories of all time is going to be when we sang “Santiago” in León. We had struggled with the song in performance and that was the first time I was truly happy with how it went; it didn’t really sink in that we had finally gotten it until we moved into the final section of the piece, the prayer to St James followed by the pilgrims’ chant. I felt this amazing sense of release when all the small choirs began singing “now and evermore,” like I could finally breathe, and I couldn’t stop crying (neither could Gabriel). It was an amazing experience." "This tour was one of the most special and meaningful experiences of my life, and I feel extremely lucky that I got to be part of it. Seriously, who gets to walk around and daydream in medieval towns marveling at their rich history, and also sing in gorgeous cathedrals with 85 amazing musicians?" "When we left Spain, I felt like I had been there for years. Every day we spent was so full, visiting churches and museums, eating endless jamón y queso and chocolate con churros, and of course singing the music that brought us all there together. I began to understand how this corner of the world changes the people who visit it, through the uninterrupted time we spent with each other - a huge contrast to everyone’s busy schedules during the school year - learning so much as the journey joined us together. As we sang so many times before we learned the meaning of these words, eultreya esuseya - forward and upward. Now, and ever more." "I am so grateful that the Glee Club was given the opportunity to take this journey together. I think we first realized that it would be a magical week while driving through the rapidly changing terrain soon after landing in Madrid. A lunch picnic in Bilbao, sitting peacefully under those magical trees, a perfect chord in Veni, climbing to the top of Burgos, emotional renditions of Brahms, a snowy photoshoot in León, chasing after my comrades for tour photos and videos, a Parry performance that brought me to tears, the Galician bagpipes marking our entry into the Praza do Obradoiro in Santiago— these are memories I will treasure forever. The centerpiece of our program, Santiago, is a piece I’ve admired for the past five years— I never imagined I’d have the chance to sing it, let alone with 86 of my best friends. So much gratitude to our incredible directors and the wonderful supporters who make tour possible." "Thank you to all who helped make this phenomenal tour with lifelong friends to amazing places possible. I’m so grateful for the opportunity." 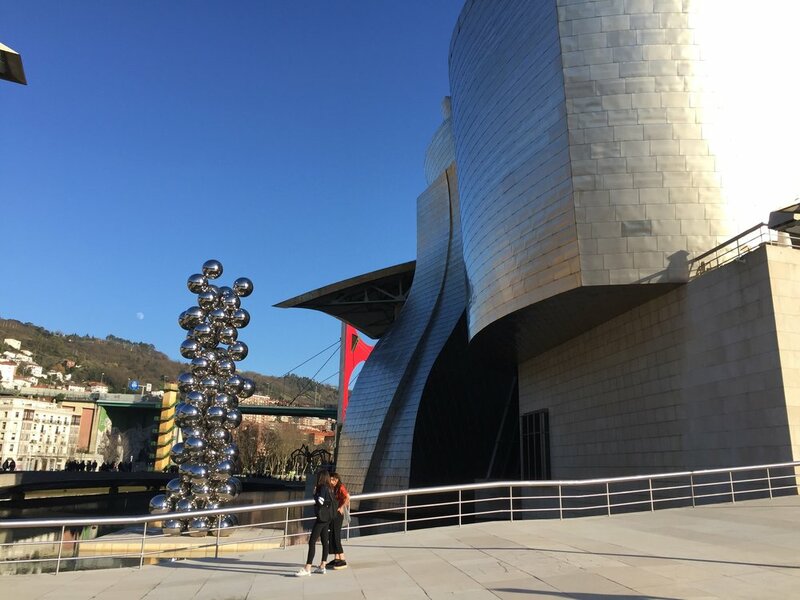 "Tour was a dual experience of learning about the culture El Camino and Spain and getting to know the remarkable members of the Glee Club. I am so thankful for those who made this trip possible." "This tour was an opportunity to be immersed in an unfamiliar place with the most fun, thoughtful, and inspiring people I have met in my short time at Princeton. I’m so grateful for the hard work it took to put it together and for everyone in the Glee Club for being so kind and open to adventure." "Tour was a wild ride that I’ll never regret taking. Getting to make music in some of the most beautiful places I’ve been with some of the most beautiful was truly breathtaking." 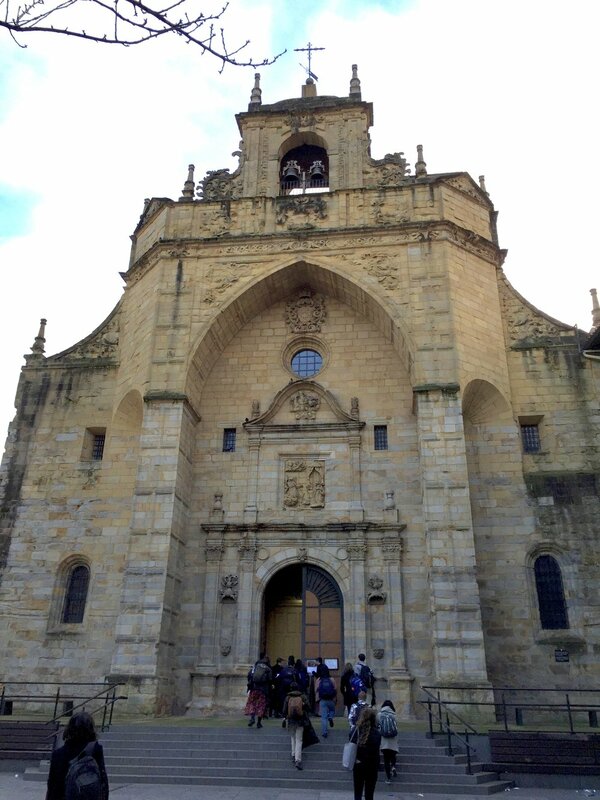 "Going to Spain with the Glee Club was one of my favorite experiences of my Princeton career. 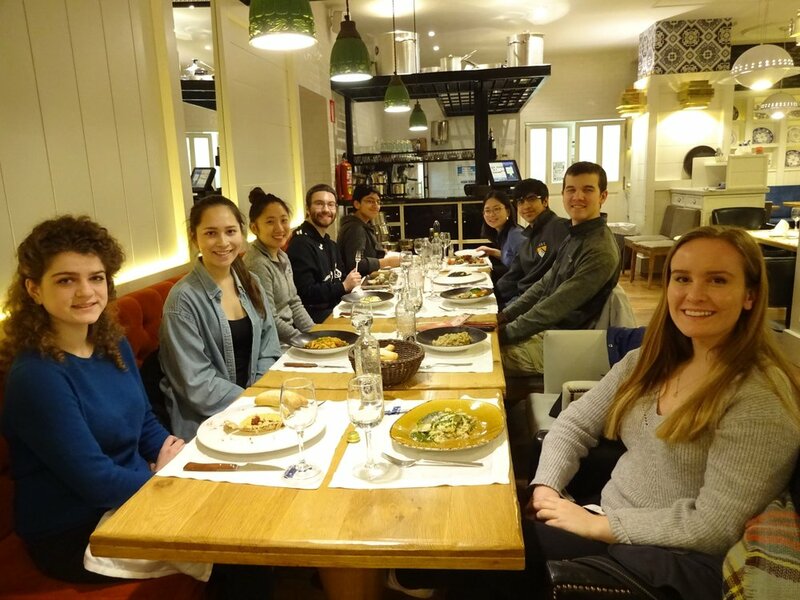 I will long remember the beauty and history of Galicia, Castilla y León, and the Basque Country, but what will remain with me the most is the amazing interactions I was privileged to have had with some of the best people at this University." As a senior in the Glee Club, today was not not the last day of our tour in Spain, but the end of my final tour as a member of the Glee Club. And, I couldn't have asked for a better way to end this journey. We started off the day with an early breakfast at our five star hotel. We had fresh fruit and lots of coffee to ensure we were awake and ready to explore the beautiful concert venue we were to perform at later in the day, the Monastery of Saint Martin Pinario. We trekked through the rain to the beautiful monastery. At noon, about 50 members of the glee club descended upon a jazzy little restaurant in the market, Restaurante Abastos 2.0, which served amazing traditional razor clams and large prawns. Gabriel was on first name basis with the owner, Nadal, who opened the restaurant early so that we could try this Galician dish. To thank them, we performed an impromptu rendition of Precious Lord. To top off our lunch hours (in Spain lunch is 2-5pm), the entire choir headed to the outskirts of Santiago de Compostela for an indoor picnic, since the rain canceled our original picnic plans. Full on finger sandwiches, sausage, cheese, and bread, we then headed back to the hotel for a free afternoon. Some of the members braved the rain and went into town to explore. However, most of us decided to take advantage of our five star hotel amenities and get our voices ready for our final performance by using the steam room and sauna. I have to say it worked quite well. We also had fun swimming in the pool as well. With our free afternoon complete, we met in the lobby to head back to the monastery for our concert. After a quick warm up in the hallway, we walked out to the altar, where the priest of the monastery gave a wonderful speech about our "Camino de la Musica" from Bilbao, to Burgos, Leon, and finally Santiago. Referring to the previous day, when we walked the final leg of the pilgrimage from the summit of Monte de Gozo, the priest called us pilgrims on the path of music, summarizing our journey here to Spain, and our journey since arriving. The concert was a brilliant end to this tour and will be one I never forget. As we started the end of our song Santiago, when we sang "we have walked out of our lives..." I couldn't help but feel so lucky to have had this experience and so moved by the music we had made. In 17-part harmony, we walked off the altar into separate chapels to surround the audience as we sang the final three minutes of the song (like we have done with each concert). But being in Santiago, across the square from the Cathedral of Santiago, and it being my last tour concert, there was just something truly special and magical about the ending of this song. We finished the night in a classic Princeton way with a few locomotive cheers for the Glee Club, our directors and our couriers at a farewell dinner at one of the nicest restaurants in all of Santiago. I couldn't have asked for a better way to end my final tour with Glee. Thank you to all of you who have followed our journey on this blog and thank you to all of you who have supported the Glee Club. This tour and the past four amazing years with the Glee Club wouldn't have been the same without your help and support. Our full day in León was a blast! 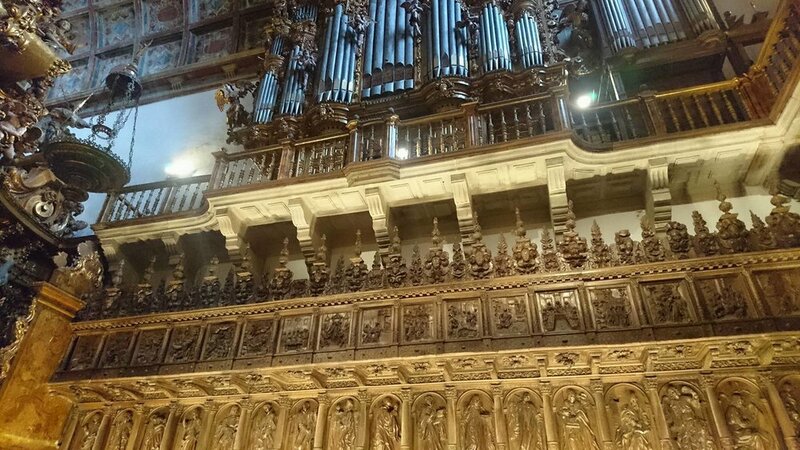 After a substantial breakfast at our beautiful hotel, the entire Glee Club took a tour of the Basilica of San Isidoro and the Catedral of the city. The latter was my favorite church so far, particularly because of its extensive stained glass and numerous chapels along the east end of the building. After the tour, a few of us looked around for lunch; we ultimately decided to go for a three course meal at a reasonable price, which was enjoyed by all. Although we all wanted to continue exploring León, it did get quite cold all of a sudden, so a few of us returned to the hotel to warm up (I even stole a quick nap in the process). When I had worked up the courage to go back outside, I joined a group headed for churros and chocolate but a friend and I wanted to try out a cool pastelería nearby. We indulged unabashedly until it was time to go to the church for our pre-concert soundcheck, which went very smoothly. The Glee Club then gave what I thought was our finest concert yet to a packed audience. The day concluded with a filling dinner at a quiet restaurant near the hotel, and we made the short walk back through the snow before calling it a night. León was a real treat, and I’m looking forward to continuing on to Santiago de Compostela! Our second concert day was in the amazing Burgos cathedral. We originally were supposed to perform in a smaller chapel but amazingly got upgraded to sing the main chapel. Throughout the entire day I was ecstatic that we were going to be singing in the third largest cathedral in Spain. Not only was it such an amazing venue from an aesthetic perspective, but I just felt so honored that we could share our love of music with the people of Burgos. Backing up in the day we had a full day of free time. I went to a convent on the outskirts of the city with a group of other Glee Club members. It was such an amazing experience to learn about the history of the convent, and especially to see the mixing of cultures that exists in Spain. Even though the convent is thoroughly Catholic, the highlight of the decorations were the Moorish wall and ceiling designs. It was so interesting to see this blend of cultures that couldn’t really exist anywhere else in the world. Another amazing aspect of the day was that we had so much time to get to know some of the members of Glee that we normally don’t interact with much. As a tenor I don’t see much of the altos and sopranos so it was wonderful sharing a long Spanish lunch with some of my fellow glee clubbers Sophie and Matre. After lunch I was hoping to check out the Human Evolution Museum, but was confronted with the infamous Siesta and realized that the museum was closed for several hours and instead went back to my room to memorize music. Moving forward to the actual concert, I was so moved when I got to see the concert attendees just loving our performance. Music is an amazing art, a language of emotion almost, and seeing its effects on people from a completely different culture was just pure bliss. Shruthi '18 and Eli '20 with Santiago. Hello! We are Aparna and Shruthi, seniors in the Glee Club and tour roommates. 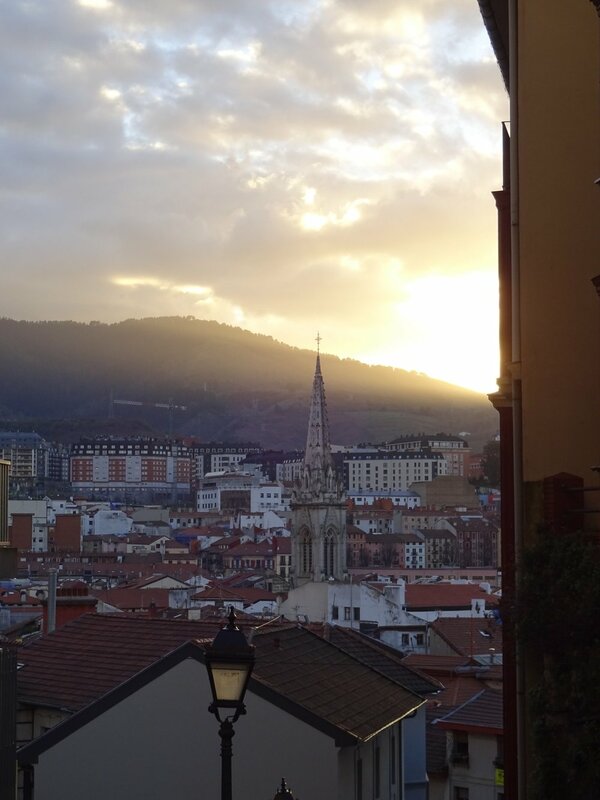 Today morning, we had to say goodbye to Bilbao and set off for our next destination, Burgos. Before we left, a couple of us went to Aldi - our new favorite supermarket - to pick up groceries for a vegetarian, affordable picnic lunch. At 11, we boarded the bus for Burgos. The scenery throughout the ride was idyllic, though many of us chose to read or nap or do our favorite thing-- discuss music! Once we reached Burgos, we enjoyed a lunch of hummus, bread, cheese, and carrots with our friend Eli in the sunny Paseo del Espolon, a promenade next to the Arlanzon River. Shruthi had an awesome time teaching Aparna and Eli about kalpana swarams, a type of improvised rhythm-- we probably amused the locals with our *cute* attempts. As were were chatting, a man named Santiago(!) Arroyo came up to us and asked if we were part of the American singing group that was visiting (we weren’t sure how he guessed, but it may have had to do with our loud English conversation and Eli’s Princeton hat). Turns out, he had helped other Glee people find eating options, but he had not been able to chat with them as much as he hoped. He explained that his daughter was actually a graduate student at Columbia (small world!) and that he would love to connect her with us if possible. In addition, he gave us some fascinating information about the role of Burgos in the American Revolution. Turns out, Ben Franklin negotiated with the Spanish monarchy in Burgos. Spanish support allowed American insurgents to participate in Mississippi river transport - which was necessary to send gunpowder to settlers, for example. Had the negotiations taken place in Madrid, British spies would have likely found out about this deal and stopped it. After chatting with Santiago, we headed to Catedral de Burgos for a guided tour. Our tour guide was phenomenal; we particularly enjoyed the explanations behind the various private chapels inside the cathedral. Afterwards, our guide took us around the city and introduced us to a very important person - the statue of the local hero El Cid, who was a Castilian soldier in the eleventh century. Following the tour, we checked into our lovely hotel. Aparna found a local grocery store and stocked up on some delicious essentials; meanwhile, Shruthi went out to dinner with some other Glee members. Tomorrow, we plan to explore the city, and maybe visit the Museo de la Evolución Humana and Castle of Burgos. 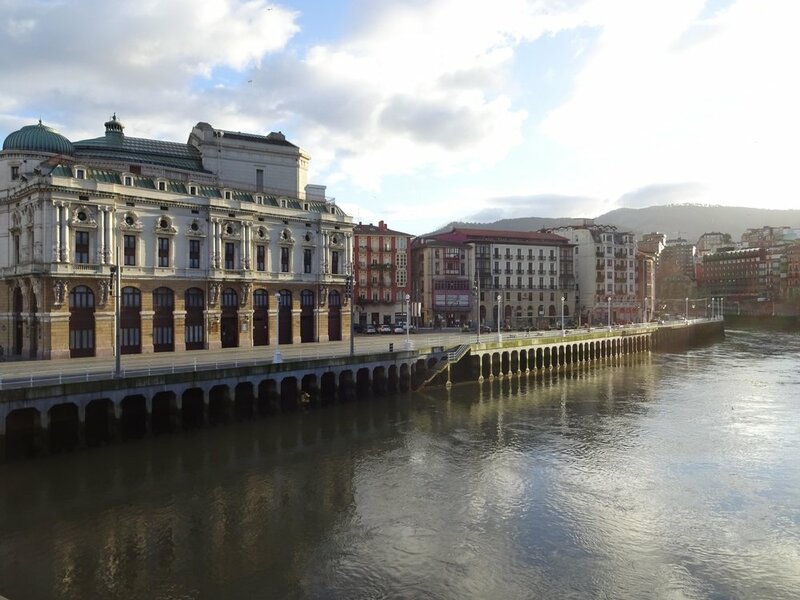 Today was the first full day of PUGC’s venture into northern Spain. Our initial victory came in a beautiful chapel where we anchored ourselves to the Lord and began our pilgrimage to Santiago. The spirit our music brought, along with the beaming faces of the locals made subpar airline food and a lack of working blow dryers, absolutely worth it. Enough cannot be said about the kindness and warmth that the Spanish people have shown us. As many of us are non-Spanish speakers, the locals have proven themselves very adept in playing charades with us. Other than the concert, the Guggenheim museum was the highlight of the day. The museum itself is a stunning work of art. Flowing walls open up to magnificent windows while a giant puppy made up of flowers protects the site from any intruding 30 ft squirrels. Inside the museum is a fascinating cornucopia of both the thought-provoking and the “I feel like I could have made that myself”. All in all, today was superb for the PUGC.